There are several boiler types used in Ireland. Seven most commonly ones are listed below. They are split into two main groups: the environmentally-friendly heating systems and more-traditional, non-eco-friendly systems. Eco-friendly heating systems emit very little or no CO2 into the atmosphere. They use renewable energy source in place of fossil fuels. Modern biomass systems are very efficient, with wood boilers able to make use of up to 90% of the potential energy available. Biomass is considered to be ‘carbon neutral’; its combustion does not add to the existing carbon cycle, unlike burning fossil fuels. Biomass is one of the oldest sources of fuel and it ranges from specifically-grown energy crops (such as straw, willow rotation coppice and wood) to organic by-products (including wood pellets and wood chips). Wood pellets are the most refined biomass fuel, being made exclusively from compressed sawdust and wood shavings. They offer significantly lower storage, transportation and handling costs than other systems and a consistent and reliable heat output. Adding solar panels to provide hot water and boost your heating is the most cost effective and environmentally friendly way to reduce your heating and utility bills. Although solar panels won’t heat your entire home on a freezing cold overcast winters day, they will satisfy on average 70% of your hot water needs. Watertech offers installation of both Photovoltaic Solar Panels and Evacuated Tube Solar Panels. We also supply the panels, water cylinders and all other required parts and accessories. Read more on Solar Panels page. 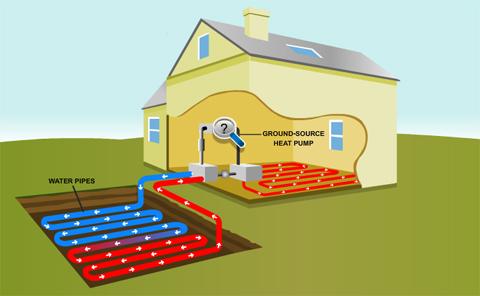 Geothermal heat pumps work on the concept that during the day the ground absorbs and stores sunlight energy. This energy can then in turn be extracted and used to warm up your home. The three main components of a geothermal system are a ground source heat pump, a loop and ductwork. This system works well in moderate climates, where summers are long and winters are mild. It is more expensive to install than a conventional heating systems and you need 250-400 sq metres of clear ground to install the underground pipes. Running costs are low; just electricity to run the pump. However, in prolonged very cold spells, an additional source of heat may be required. Traditional boilers rely on fossil fuels for hear and energy. Although cheap and efficient, they contribute to environmental pollution, global warming and are being slowly replaced by more modern, “carbon neutral” sources of energy. Coal boilers are good source of heat , but provide very high carbon dioxide emissions and they take up a lot of space. They also contribute to the drying of wetlands and the destruction of natural environment. Coal and peat products, including peat briquettes are subject to carbon tax and are slowly becoming replaced by cheaper and more environmentally friendly sources of energy. 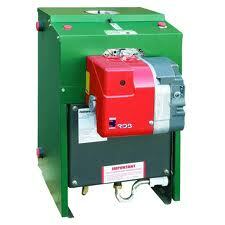 Oil fired central heating boilers burn kerosene or heating oil. 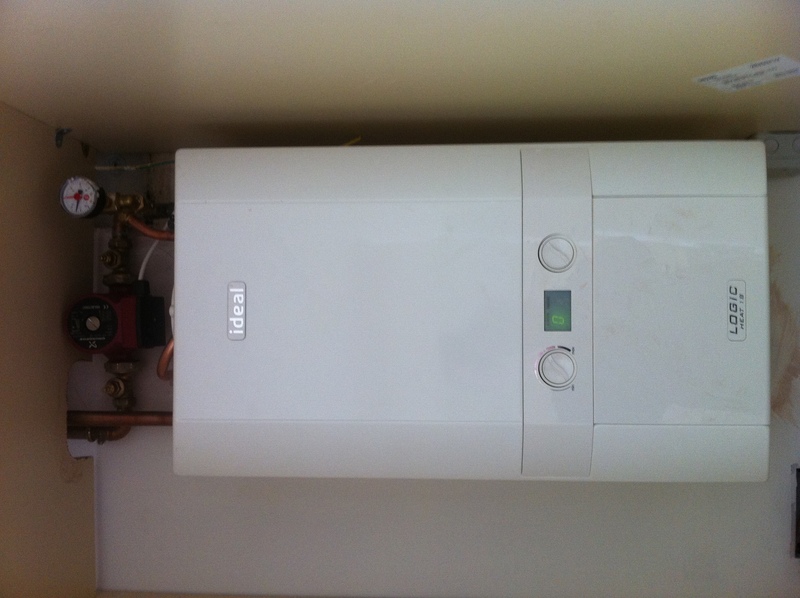 This is the most popular system where mains gas is not available. Oil is delivered in bulk 500L to 2000L depending on your tank size. This means you only need a delivery of oil a couple of times a year. So although oil is slightly dearer than mains gas it is almost as convenient and easy to maintain. Modern high efficiency boilers burn with almost no smell or fumes but as they are slightly larger than the equivalent gas unit they are usually floor mounted often in a garage, cellar or outhouse . Although electric heating systems are efficient, 100% almost, electricity is an expensive way to provide space heating. Electricity can be used several ways to provide heating but only two are really central heating. Where the electricity heats water that is then pumped through radiators as normal or a hot air system heated from a central point. One system that was popular for a while was storage radiators. In this system electricity is used to heat bricks in a sealed radiator and by opening a flap air circulates and heats the room. The benefits of this system were simplicity of installation and cheaper off-peak electricity, but as the off-peak is not cheap and the radiators themselves are expensive, they are really only effective as low level background heating. Using electricity to add extra heat, in very cold weather, to a geothermal system can be an option can be a cost effective option as no additional boiler or fuel supply is needed. Modern gas boiler units are small, light weight and make very little noise, and can even be installed in cupboard the size of a kitchen unit. The two main types are mains gas and bottled gas (propane). Where mains gas is available this is usually chosen both for convenience and cost. It is also possible to get boilers that can heat water for taps directly therefore saving the expense and space of a storage tank. 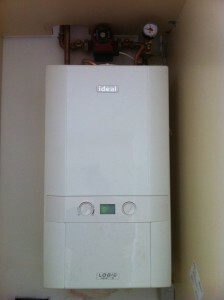 Read more on High Efficiency Boilers page. Watertech can advise you which type of a boiler is most suitable for your particular application. We also install oil burners, high-efficiency gas boilers and solar-powered water heaters. Contact us for a FREE quotation.